The animals that live in Svalbard year round are adapted to extreme seasonal variations. It is polar night from November until the end of January and midnight sun from the middle of April until late August. The average temperature is below freezing from September to May. In addition the winds make the effective temperature even lower. 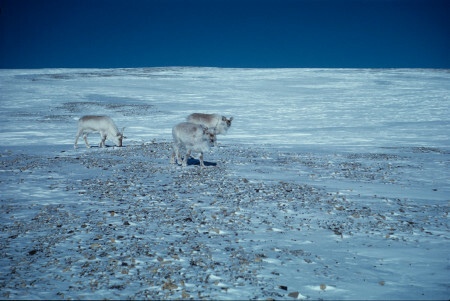 At the same time the climate is extremely variable, and when extreme cold occurs immediately after mild weather, the tundra can become covered in ice. This has great consequences for animals that are dependent on grazing the vegetation underneath. The time for mating, egg laying and birthing, migration, shifting of fur or feathers, fat deposition, seasonal variations in bodyweight, activity or food intake are exactly regulated and adapted to changes in light and darkness during the year. This presupposes that the organisms are able to measure time. They have an inner clock or calendar. The clock is regularly synchronized by external light and dark signals that the rotation of the Earth and its movement around the sun creates. In Svalbard this rhythm is greatly weakened or missing for long periods. Both the Svalbard reindeer and the Svalbard ptarmigan have during long periods of the summer and winter a pattern of activity that is independent of the time of day. They are therefore less dependent on a daily rhythm than is the case for the same species farther south. When the difference between the animal’s internal temperature and that of the surrounding air increases, the animal counteracts this by increased insulation or heat production. Large quantities of fat stored either under the skin or around the internal organs are used as insulation and nutritional supply. Svalbard ptarmigan, Svalbard reindeer and arctic foxes increase their bodyweight by up to 30% during the autumn. In addition arctic foxes and reindeer shift from summer to winter coats. The winter coat gives a layer of insulation, which helps to keep the skin warm. Svalbard reindeer have hollow hairs with stationary air that give good extra insulation. 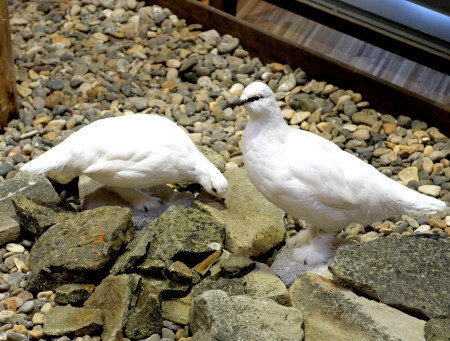 The Svalbard ptarmigan shifts to a thick white coat of feathers for winter. In addition the arctic fox has hair under its paws and the Svalbard ptarmigan extra feathers around the feet in order to prevent heat loss whilst standing on ice and snow. Even if animals cannot do anything about the temperature of their surroundings, they can minimise the affect of the cold by their behaviour. The Svalbard reindeer saves a lot of energy by its tranquil way of life. The Svalbard ptarmigan minimises heat loss from its body by digging ‘docks’ in the snow to shield it from the wind and low temperatures when not eating. The arctic fox can lie in lee of the wind and curl itself into a tight ball to reduce heat loss, using its thick tail as a mattress, sticking its snout under the base of the tail and letting it be snowed under.